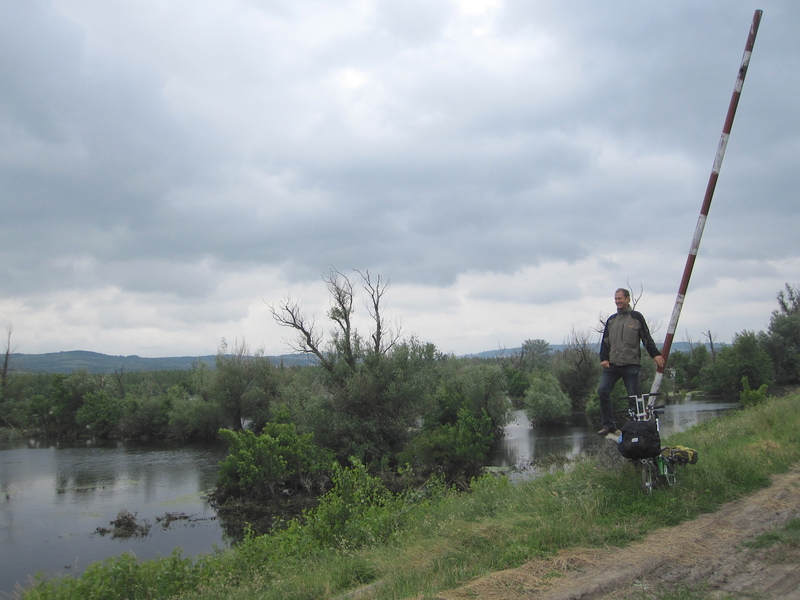 Cycling the Lower Danube. Euro Velo Route 6. Day 2. After what came to be a familiar breakfast – omelette with goat’s cheese, tomato, cucumber, white sausage, and strong coffee – we left Kovin in Serbia on a road parallel to the river, but some way inland. Roads generally reasonable, though sometimes boringly straight, but the occasional pot hole made sure we didn’t just look at the scenery. The border crossing at Kaluderovo had built up something of a backlog over the officers’ lunchtime – remarkable how quickly they could deal with it when someone in command clicked his fingers. So, we were in Romania, and stopped for lunch. One of the features of cycling in Romania we had been warned about was the number of loose dogs, sometimes in packs. Less than 3km inside the country a pack of eight showed an unhealthy interest, hurtling down a hillside to intercept us. Fortunately my friend likes dogs and talked to them nicely, avoiding injury. But they weren’t the last to worry us. 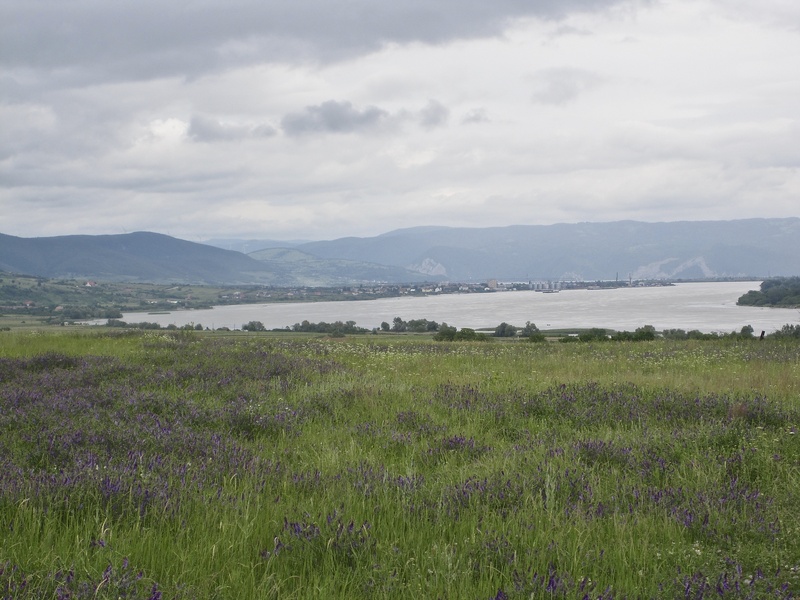 We took a short-cut across a spur of hillside (lovely well-engineered road with steady gentle gradients) which rewarded us with wonderful vistas of the Danube. A pizzeria in Moldova Veche also provided accommodation so we left the bikes and ambled round the town. 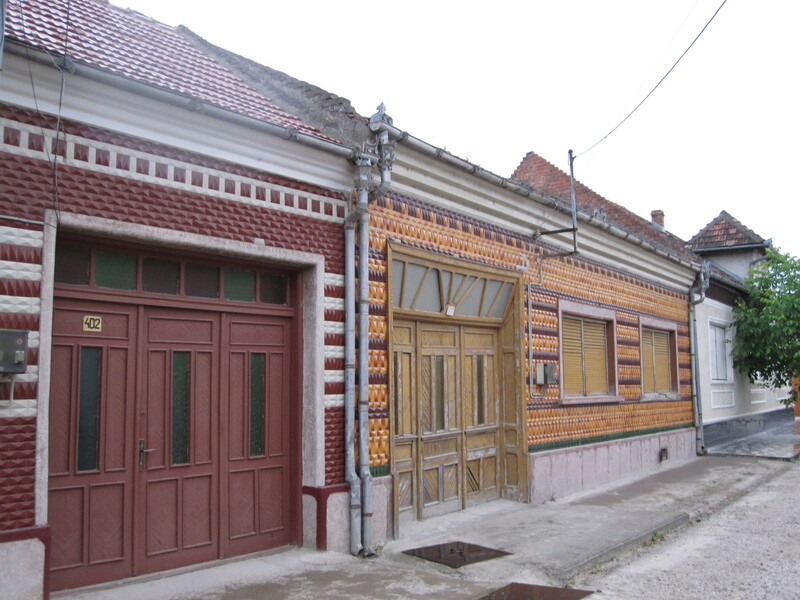 Many, if not most, of the predominantly single-storey houses had ceramic facings on the walls, something we saw nowhere else. And we went to look at the river, having spent much of the day at some distance. 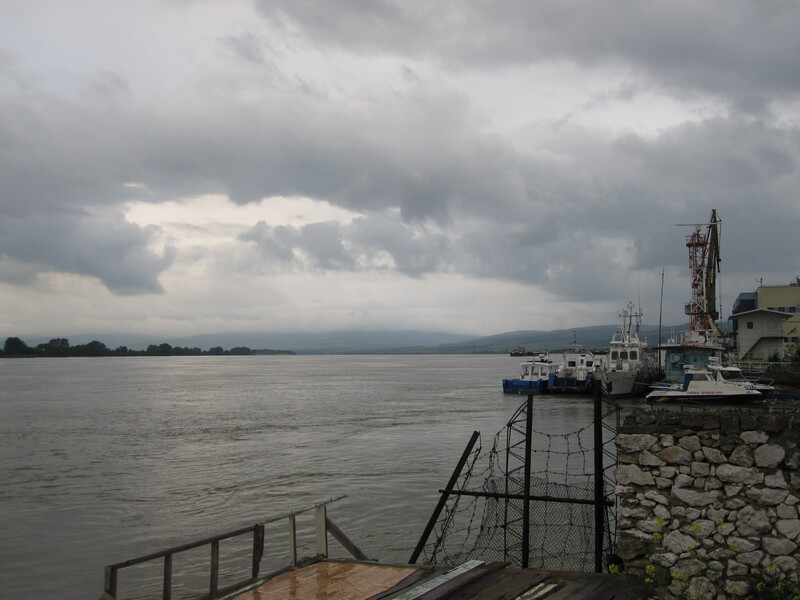 Many of the towns we stayed in had a port area beside the river but, with the exception of Lom in Bulgaria, nothing seemed to be happening there in the way of river transport being loaded or unloaded. Compared to the Rhine, where the passage of laden barges in both directions is constant, the Danube along this stretch seemed little used for freight. Most days, though, we saw at least one cruise ship, long and low. Note: in spite of appearances, we hadn’t yet been rained on. 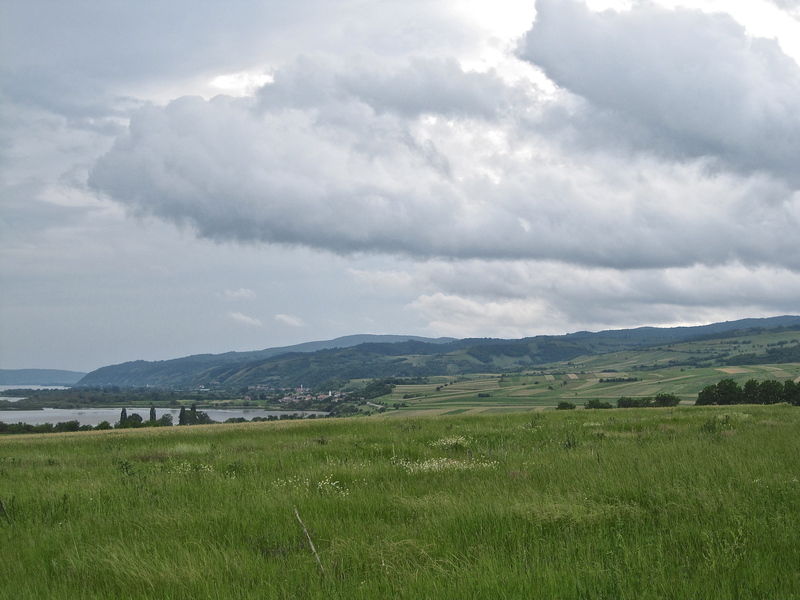 Posted in Out and About | Comments Off on Cycling the Lower Danube. Euro Velo Route 6. Day 2. 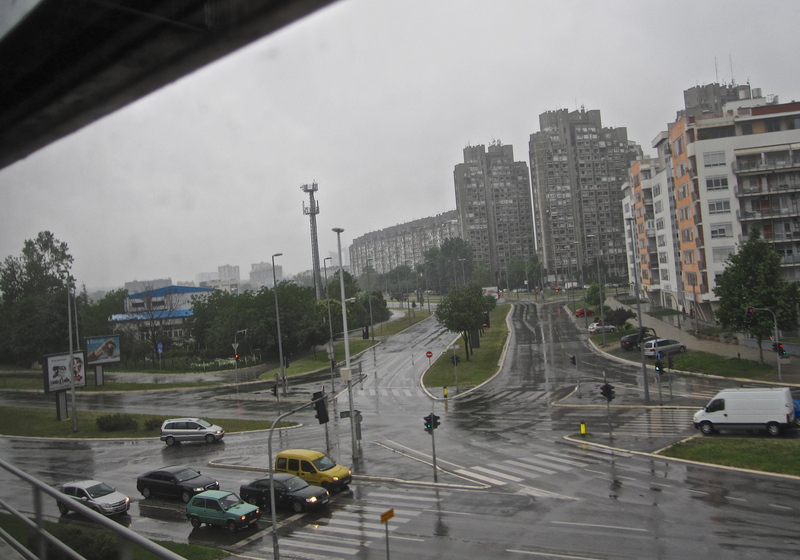 Coming into Belgrade by train at 6.30am on a wet Saturday morning, in a sleeping car that dated from before WWII, was the most depressing point of the whole trip. I began to wonder why we had come. Huge blocks of Communist era flats – inhabited but decaying. But after a couple of coffees and a sandwich at the bus station, and the rain having stopped, we set off towards the Danube bridge. We had heard that this was tricky for cyclists. Actually – terrifying. No chance using the roadway and the sidewalk was narrow and uneven, threatening to throw us off into the traffic maelstrom at any moment. But we survived and, thanks to the signage for route 6, which in Serbia was excellent, we soon found ourselves on the flood dyke heading east. As you see, the flood plain was indeed flooded (there had been torrential rains south of here in previous weeks) and, that we were riding Bromptons. Here, on day 1, we heard the first of many cuckoos who were calling throughout our trip, and too we were first introduced to the wild flowers in profusion which lined every road and track in the countryside. We had no trouble finding a cafe for lunch, nor a pension (bed and breakfast) that evening, in Kovin. Dinner was a bit more difficult – the first of many well concealed and near deserted restaurants, but excellent when it came. Nearby, a nice bar with decent local beer. 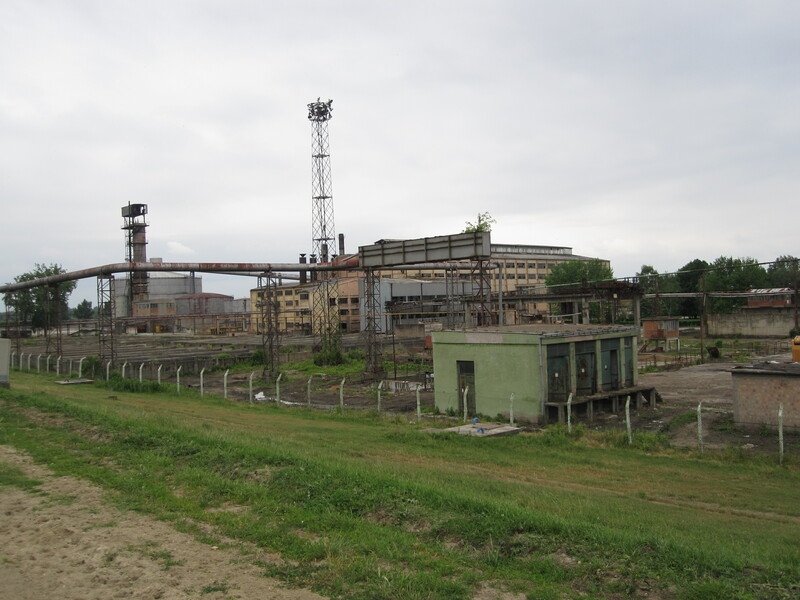 Also, the first of many abandoned and derelict factories, which we found particularly in Romania. A result of the fall of Communism and the changing map of world manufacturing. On the Sunday morning, as we had breakfast, we watched as ancient tractors, ancient horses and carts, and ancient people riding ancient bicycles passed by on the street outside. (We decided Kovin was the world capital of slow cycling – unbeatable). There was a farmer’s market – very busy, all over the road, and bringing life to what had seemed a dull, spiritless town. We headed towards Romania. You are currently browsing the Number Seventy blog archives for June, 2014.